By Daniel Horowitz--Television has been referred to as a “vast wasteland”. But for 86-year-old Torontonian and Holocaust survivor Gerda Frieberg, television recently served as a portal into the past. The year was 2009. It was 5 a.m. when Gerda, a past chair of Canadian Jewish Congress Ontario Region, a member of United Jewish Appeal’s Atarah Division and, in 1985, the founding chair of UJA Federation’s Holocaust Education Centre - now the Sarah and Chaim Neuberger Holocaust Education Centre - unable to sleep, turned on the set to help pass the time from dark to light. It was then that she began flipping from channel to channel when, suddenly, she saw a face - a face that took her back more than 60 years. It was the face of renowned artist Samuel Bak, now 78, a man who Gerda had first met during her time in a Displaced Persons Camp in the German town of Landsberg from 1945 to 1949. She still remembered Samuel as the fresh-faced young boy of 12 or 13 who accompanied his mother on her regular visits to Gerda – the camp’s consummate seamstress - who made many of her clothes. Now, thanks to the show on WGBH Public Television early that morning, which highlighted Samuel Bak and many of his paintings depicting the Holocaust, Gerda’s questions were finally answered. But it was one painting in particular that caught Gerda’s attention. That summer, soon after sending the letter, Gerda was on a plane to Boston to connect with the successful artist. “I had always thought about Samuel, and wanted to reconnect with him after all these years,” says Gerda. “But, until that television show, I couldn’t remember his last name. Every time I saw a painting depicting the Holocaust, I thought it might be his. I was never sure, but always curious. Now, I finally knew for sure.” Gerda, so impressed with her friend’s work, began campaigning to have Bak’s exhibit brought to Toronto. And, thanks to Gerda’s energy and tenacity, she has turned her dream into a reality. 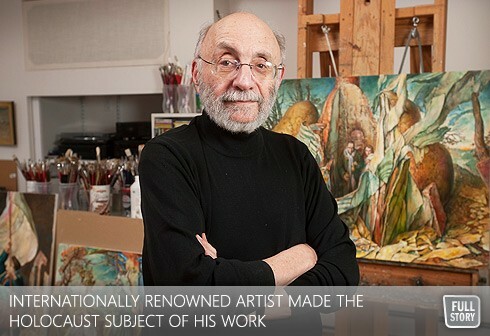 From March 1 to April 30th, 2012, UJA Federation of Greater Toronto presents “Icons of Loss: The Art of Samuel Bak” at The Columbus Centre’s Joseph D. Carrier Art Gallery (901 Lawrence Avenue, West.) This is the first major exhibition of Bak’s work in Canada. For more information about “Icons of Loss: The Art of Samuel Bak” contact Shai Abraham at sabraham@ujafed.org or 416.635.2883 ext.5153. Admission to the exhibit is free.